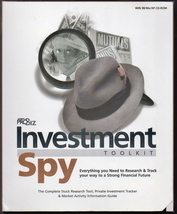 Investment Spy Toolkit Stock Market PC CD-ROM by Pro Biz NEW Everything you need to research track your way to a strong financial future Product Information"Investment Spy Toolkit brings the beginner intermediate or advanced investor up to speed immediately with the tools and resources needed to make informed and profitable investment choices.” The complete stock research took private investment tracker and market activity information guide.With the explosion of online trading and the availability of information on the Internet there has been a revolution in the stock-trading world. 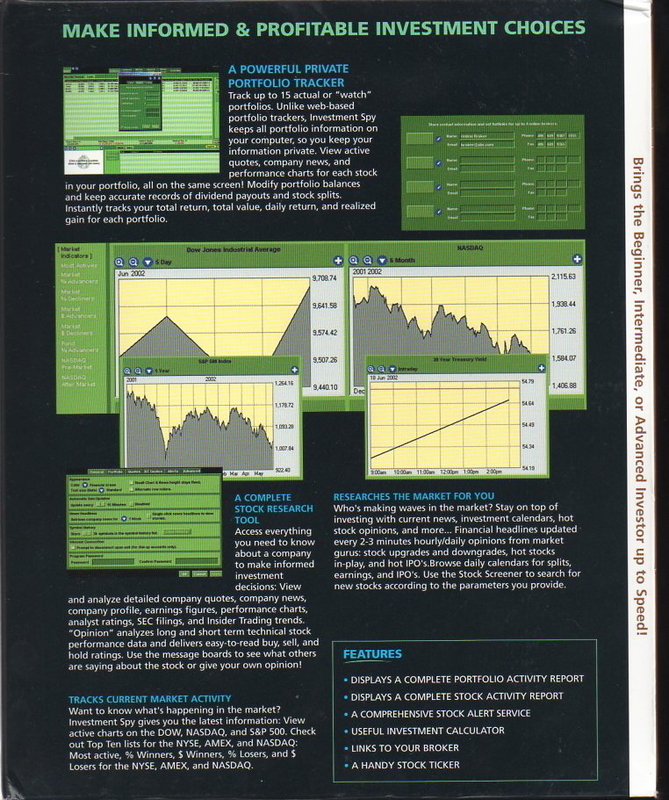 Stock Markets around the world have digitized trading enabling traders to buy and sell stock real-time from anywhere in the world. 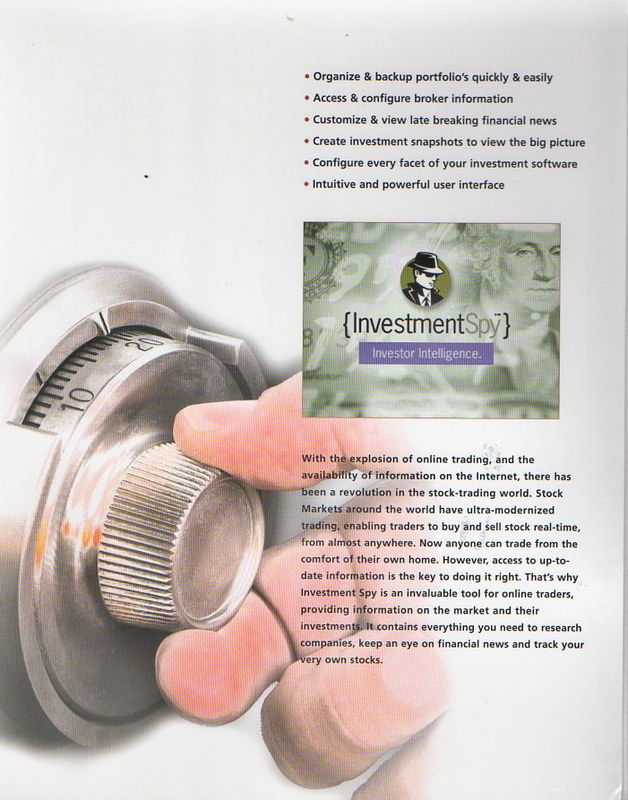 Now anyone can trade from the comfort of their own homes however access to up-to-date information is the key to doing it right. 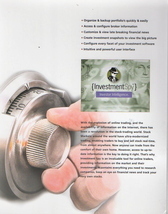 Investment Spy is an invaluable tool for online traders that provides information on the market and your investments. 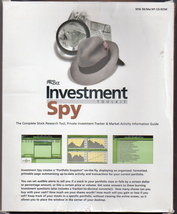 It contains everything you need to research companies keep an eye on financial news and track your very own stocks.Product Features Investment Spy creates a "Portfolio Snapshot" on-the-fly displaying an organized formatted printable page summarizing up-to-date activity and transactions for your current portfolio. Set audible alerts to tell you if a stock in your portfolio rises or falls by a certain dollar or percentage amount or hits a certain price or volume. 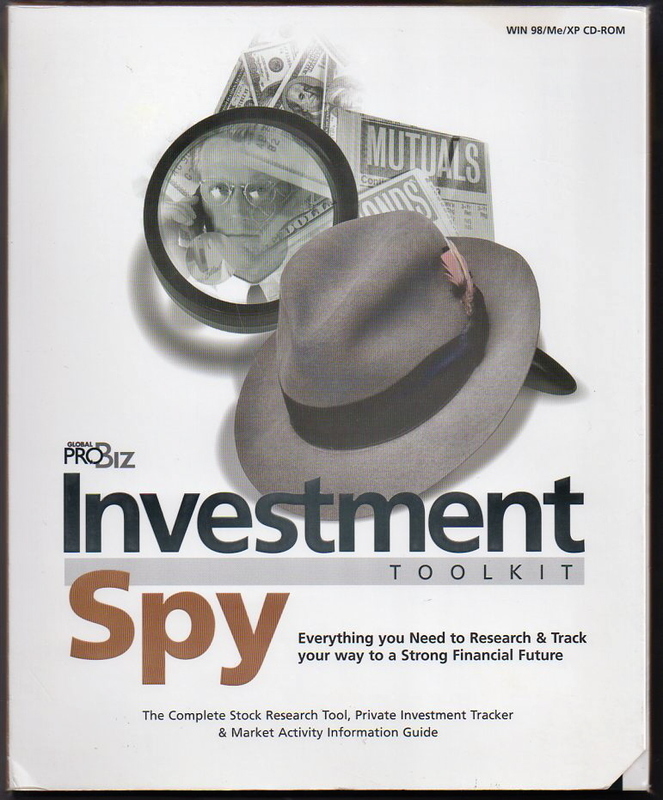 Useful Investment Calculator Includes a fraction-to-decimal converter Configure Investment Spy to hotlink to your broker of choice for quick access to trading. 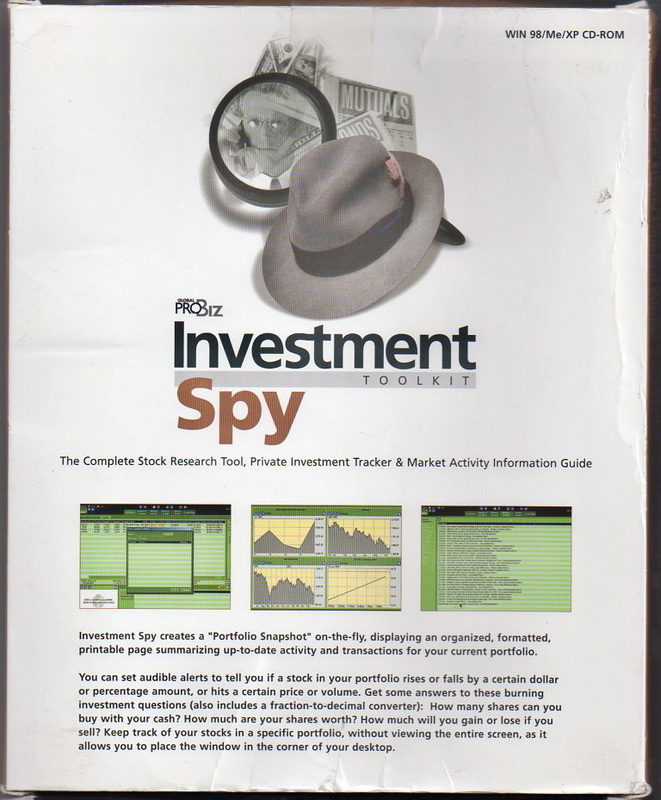 Keep track of your stocks in a specific portfolio without viewing the entire Investment Spy screen. 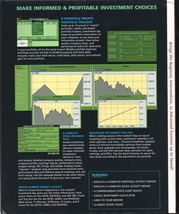 Select color schemes and adjust font sizes Configure data and program updates Choose how much news to view Organize portfolios / backup your portfolios Configure broker information and more!System Requirements Windows 98 Me or XP Pentium 400 or better Minimum 64 MB of RAM (128MB for XP) 5.0 Free Hard Disk Space CD. CD-ROM is new and will be shipped in factory sealed jewel case without box.